Last Friday I was invited to talk at the International Partners’ Conference at Regent’s University London. 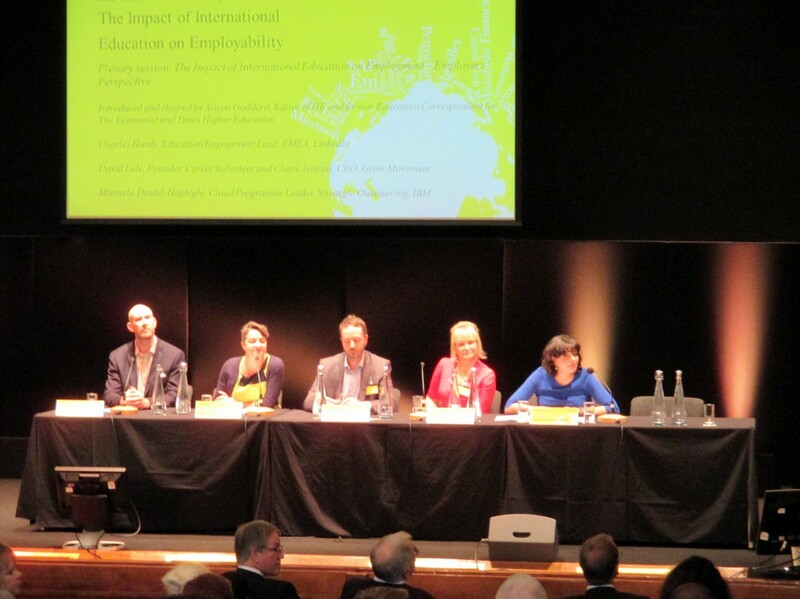 That is the second year this conference takes place and this year’s topic was The Impact of International Education on Employability. Regent’s University London offers Bachelor degrees in International Business and International Events Management during which the students have to study a foreign language and spend two semesters abroad at one or two partner institutions or do one semester abroad and second on a work placement that has to be related to the course of study and approved by the university. Academia, employers and students were invited participate in different sessions and share their experiences. That surprised me in particular, was that there are certain qualities recruiters are looking for, but won’t tell you. During my studies I spend one year abroad in Germany which was very beneficial for my career. Not only I perfected my language skills, I also learned about the culture, travelled and met international friends. For some students going abroad is not easy, because it makes you come out of your comfort zone and start almost from zero – making new friends, looking for accommodation, adapting to a new culture etc. The question remains – is going abroad will make you more employable person? I was curious to hear what employers have to say about it and attended the session “The impact of International Education on Employment – Employers’ Perspective” where they discussed the skill set and other attributes employers are looking for from graduates. One of the panellists, Manuela Doutel-Haghighi, Cloud Programme Leader, Strategic Outsourcing at IBM shared how they hire. I agree with every point she made and I want to share it with you because that is very relevant for the events industry as well. Events industry is very competitive because some employers don’t recognise event management degrees and are looking for employees with specific skills-set, other jobs are extremely competitive because not only employers require skills set, they also require a work experience, and now even and international experience. Add to that all event management courses in the UK that offer to study event management for Bachelor or Master and other part time courses. Manuela started with saying that regardless the business and industry you are in, all organisations need a diverse workforce. The clients are diverse and therefore we need people from all backgrounds. She continued and said that from the moment students take the unknown, open their horizons and step out of their comfort zone, taking it into the workplace is very important. Because of the market uncertainty, when she employs people she wants people that know how to feel uncomfortable. She suggested that there is a mystery around what employers are looking for and the universities need to play a big part in explaining it to their students to narrow this gap between academia and industry in order to make the student more employable. 1. Adaptability – Experience abroad it a perfect example to demonstrate adaptability on your CV. When abroad, you have to adapt to a new culture, language, people, housing etc. 2. Communication – That in regard to languages, by learning and knowing how the language is constructed, it tells a lot about the new culture. Whether it has a lot of rules and exceptions or one rule and many exceptions that will tell you a lot about how business in the country is done. 3. Client focus – Employers recognise when the students come for an interview they start talking about themselves and how great they are. Instead, they should be talking about how they can contribute to the organisations. 4. Creative problem solving – Experience abroad can equip you with tools for creative problem solving. When you face a new situation you have to become creative and very quickly. By doing so you will be able to also adapt very quickly to a new environment. 5. Drive – Did you go to study abroad? That tells the employers that you are driven. You have drive to achieve and to “be out there”. Demonstrate it by volunteering work, travel and unique hobbies and show the employer that you can bring that attitude to the organisations. 6. Team work – Going abroad alone forces you to work with people who you may not like and who are very different from you. If you like it or not you have to adapt and be a team player. 7. Passion – When students go abroad it instantly demonstrates that they are naturally more curious and passionate about discovering new cultures and people. Show it to the employer. 8. Taking ownership – This is what will set you apart from many candidates. In the academic world students are told what to do and what to study, what to expect and what to write in exams. When it comes to the work environment there is a clash in expectations and student expect to be “spoon fed” and been told what to do. The students will ask what “I am supposed to do” while the employer will says – “here is the project, off you go and I want the results, just go and do it”. That is a big shock to the system and students that are fresh from the education system. The work place is very different and students sometimes don’t realise how spoon fed they are. “Employers want students to be able to stand on their own feet and get on with it. It is ok to do mistakes as long you learn from it”. 1. Work experience, life experience – Tell the employers about something that went right or wrong, they want to see that you have experienced challenges and know how to overcome them. 2. Explain complex items in simple terms – Being an expert in your field doesn’t mean clients or colleagues from other departments will understand what you are talking about. Thinking of events industry, there are many terms that are not familiar for the ones outside the industry (e.g. – MICE). 3. Have an opinion – Clients want to hear an opinion and not people who say “yes you are right” with everything. They want to see you question their thinking. 4. Personal values – Extremely important. Ethics in business being mentioned, many universities offer this course and I did it as well during my exchange semester. This is one of the “easy” classes but one that you remember for life. In events industry we can also mention sustainability as a personal values. In reality – and I bet you’ve heard it before – people by prom people and it is important to demonstrate responsible and ethical thinking. 5. Volunteering – Volunteering creates bonds and relationships. When companies offer volunteering as part of their CSR mission it will tell them a lot about you as a person. 6. Understanding the other and being open minded – Trying to impose your values on the other creates conflicts. Listen more and be open to learn about the other. 7. Getting out of your comfort zone – You will work with different teams and on different projects, therefore employers will value that quality of you being able to get out of your comfort zone and easily integrate in the new environment. 8. New ideas – Employers want to see that you can bring new ideas on the table. When you travelled to foreign countries you see how things are done differently and can bring a fresh perspective to the organisation. I know that is a long list, but the world of employment is so competitive you have to tick as many boxes as possible to stand out to get a job you really want, or if you are an entrepreneur, win client’s confidence to do business with you. One more thing that she hasn’t mentioned and I have learned is extremely important in the work place is the ability to work in a virtual environment. Maybe it is the millennial in me who is talking, but this skill is highly important to be successful in business. We are constantly connected via social media and email and also need to conduct phone calls over skype. Demonstrate the same skills via online communication as you would handle the person offline. I would be happy to hear if you went abroad to study or do an internship and how it impacted your career.